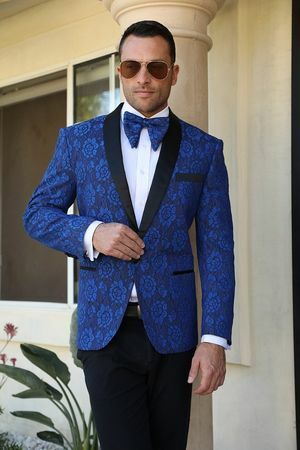 If you need a blue color fancy Tuxedo jacket that looks like the type you see Celebrities wear on the Red Carpet, you need Manzini. Manzini makes all of those fancy looking tuxedo jackets that you don't see in some boring tuxedo rental store. These are tuxedo jackets with real style. This blue floral blazer jacket has that modern fit you want to wear for a tighter look with double vents in the back and satin trim and covered buttons. Real Style by Manzini.